The holidays are about making memories with friends and family. When it’s your turn to host, you can set a truly memorable holiday table – without breaking the bank. It’s OK to mix patterns and textures because it adds another level of interest to the table. Mikasa offers many different dinnerware patterns that can be easily mixed with each other to create a great look. For example, start with red metallic chargers and add white Cameo Platinum dinner plates and festive salad plates such as Love Story Holiday. 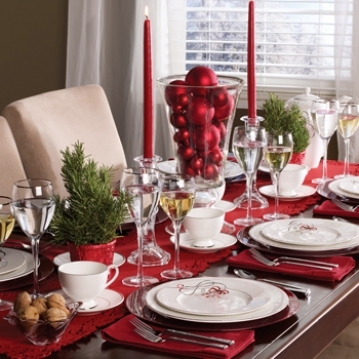 Or go for a fun, contemporary look by layering Christmas Cheers Dots and Christmas Candy Cane dishes. Be creative with table decorations. Try using what you have in new ways. Fill a Pfaltzgraff Winterberry serving bowl with cranberries, or line a Winterberry platter with pretty votives and evergreen sprigs you snip from the back yard. For an easy, long-lasting centerpiece, use potted plants. Many supermarkets sell potted plants at great prices. Rosemary plants make a beautiful and fragrant addition to the holiday table. Try setting out two pots of rosemary wrapped in red foil, then put them on both sides of a glass vase or jar filled with red ornaments. No matter how you dress your table for the holidays, the food is the real star of the show. This delicious cheesecake recipe from Travis will look good on any plate – and taste even better. For more entertaining tips and recipes, visit www. facebook.com/mikasadining. Tip: When serving, use a round mold to create individual portions, or cut slices and top each with mixed berries and a mint sprig.